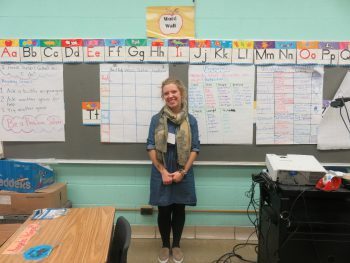 I am Sarah Schmitt and I have recently begun my s tudent teaching adventure through Chicago Semester, a program affiliated with Monmouth College. I will be graduating this May with a degree in Elementary Education and a Spanish minor. I have always had an interest in learning new languages and I actively pursued a minor in Spanish through traveling abroad to Spain and taking classes at college. Through a college sponsored trip, I was able to visit Pilsen my sophomore year. During our visit we toured the area to see the beautiful mosaics, visit the National Museum of Mexican Art, and eat authentic Mexican food. I distinctly remember crossing the street and being drawn to the school with beautiful mosaics spanning the front of it. 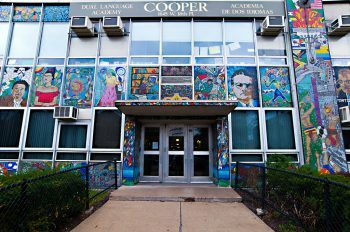 Flash forward to January 12th, 2017 and I am lucky enough to be placed at that school: Cooper Dual Language Academy in a bilingual 4th grade classroom. My 4th grade placement is a bit different for me coming from an elementary education background. My CT and I are the homeroom teachers for the bilingual class (222). In ad dition to this class, we also teach 224 and 226, which are two other 4th grade classes that do not require as much Spanish support. Students rotate classrooms to receive instruction for all subjects and ensure that their needs are met (13% of the students at Cooper require special education services and it is a magnet school for the hearing impaired.) In the classroom that my CT and I are in we only teach reading and science which will provide me with the opportunity to revise my lessons and not to make too many lesson plans! 🙂 In addition to having a great placement I also have a cooperating teacher who is incredibly friendly and true to her title (cooperative), providing me advice about teaching as well as things to do in the neighborhood. The neighborhood is a great location – La Casa is right off of the 18th stop on the “L” – not to mention that I live a block away from my school! I live with five other girls (four from Chicago Semester). 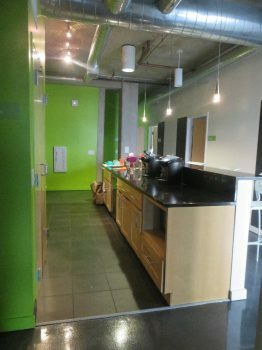 Our apartment looks like an Ikea showroom since the walls are bright green and everything is very new. My favorite part is the kitchen with the island/counter where we all can cook while we talk about the days’ events. Two of my roommates are student teachers so we always have a lot to share from student stories, edTPA, or lessons we taught. I also happen to know both of them prior to attending Chicago Semester since one of them goes to Monmouth and the other was part of Golden Apple, a teacher preparation program I attended for the past two summers. Two of my other roommates are in the nursing program and the other one has an internship at a publishing company. While we all have different schedules, we get along well and seek out opportunities to spend time together. Last weekend, for my birthday they made a cake and we went out for Mexican food. So how did I land this incredible opportunity? When I started to consider my student teaching placement, I knew that I wanted to complete it in CPS. While Monmouth didn’t initially have a program that would enable me to do it at the time, they eventually announced that they had partnered with Chicago Semester to allow students to have an urban student teaching experience (Side note: Monmouth College is in the located in central Illinois near Galesburg). With Chicago Semester, there is a lot of freedom that has allowed me to experience living in Chicago as a young, working professional. As student teachers, we meet with our supervisors for seminar/reflection once a week and the rest of the week we are shadowing our CTs and gradually gaining more control in the classroom. Chicago Semester also regularly schedules events that allow us to experience the culture and beauty of Chicago such as beginner salsa classes and trips to many of the museums. They also have a page that connects us to events happening in the city, after filtering through it I recently went to the “college night” performance of Gloria at the Goodman theatre, the Harold Washington Library, and tried out many of the local restaurants in the Pilsen area. Since Chicago Semester provided us with a UPass we also have free public transportation which allows us to get to our placements and explore as much of the city as possible! While I enjoy exploring, my main focus this semester is teaching 4th graders at Cooper. As we begin Week 3 of my placement I am gradually gaining more control in the classroom. I will be leading a group of students during “Words Their Way” (a daily vocabulary and spelling practice for students at their level) as well as leading the “Banana” group of students during guided reading twice a week. Next week, I will also begin teaching reading to 222 by introducing Frindle. I look forward to sharing more with you in the coming weeks!